There are only a limited number of tables available for you to sit. You may wish to bring your own folding tables, chairs, blankets, etc. for your comfort. 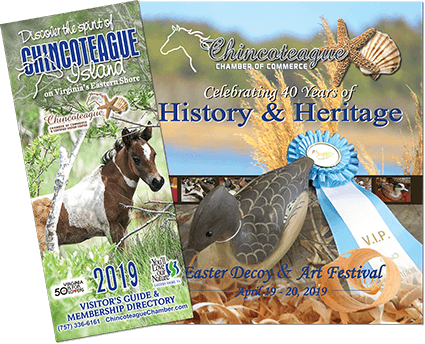 We encourage you to ride the FREE Pony Express trolley provided by the Chamber and the Town of Chincoteague. Parking is available at the campground but is limited. Festival food is served from various booths requiring you to go to each one to get what you want to eat. Souvenir trays will be on sale at the Merchandise and Beer tents to assist you in carrying your food or you may bring your own. Soft Drinks and Water are provided in the ticket price. Food will be limited per trip, per person, at each booth to allow everyone to get something without having to wait a long time. You may come back later for more. Beer will be sold separately. All attendees age 21 and over MUST provide a photo ID at the beer tent in order to purchase beer. No exceptions! Beer tent only accepts cash, so please come prepared! Souvenirs will be sold at the festival. Please keep in mind that these items sell out quickly. You might want to purchase them as soon as the gates open. There will be t-shirts, mugs, trays and hats. Merchandise is also available one week prior to festival in the Chamber Office. We accept all major credit cards in the office and on festival day for merchandise. Help us recycle! Shell and can recycling are available during the festival. Please do your part in helping our environment. Tickets for the Extravaganza of Prizes Raffle will be available to festival ticket holders on festival day. The winner is announced at 4pm at the band stand and will receive t-shirts, trays, tickets, lodging, gift certificates for meals and much more for the following year's festival. You do not need to be present to win. Tickets sell out quickly so we urge you to purchase tickets early as they may not be available at the gate since we tend to sell out before the day of the festival. Click the 'BUY NOW' button, call 757-336-6161, or visit the Chamber office in the circle at 6733 Maddox Boulevard with any major credit card. Check Facebook and Twitter for updates on ticket availability and festival news. Attendees can come and go to the festival grounds from 10am - noon. Event is held rain or shine. Every attempt will be made to have the festival on the date and time advertise, however circumstances beyond the Chamber's control may require rescheduling or delay. No refunds will be issued in such case.